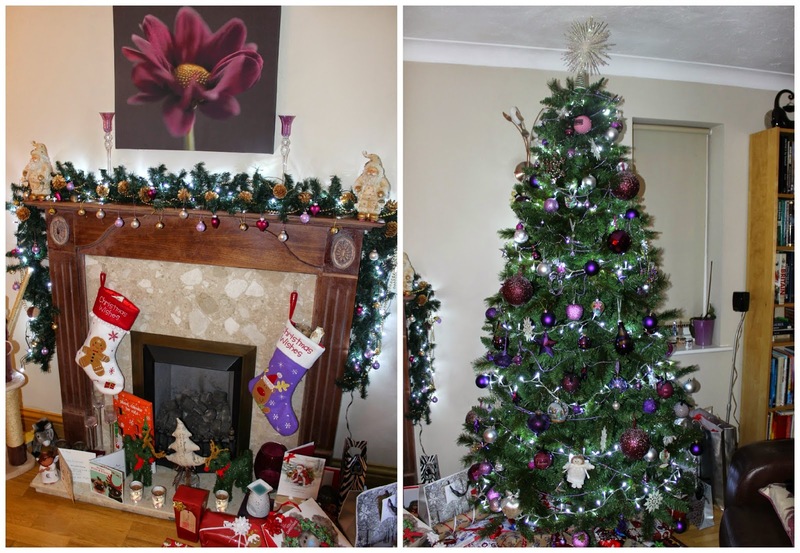 Beautiful You: My Christmas Decorations 2014! At the moment one of my favourite things is looking at everyones Christmas decorations and seeing what decorations other people have up this year, so I thought that I would share mine with you all! I have bought several new things for my room and my mum has changed up our tree a bit this year so why not! We do have a 7ft 10inch tree which is a little on the large side but seen as we have quite a big living room it doesn't look out of place. Then my mum likes to tie in the pinks and purples of the décor with the decorations on the tree, there are a mix of old and new baubles on there. The big ones are a new addition this year and they are a selection from Next which you should still be able to get and there are also a few decorations which we purchases while we were in New York! Then my mum also puts a garland around the mantle piece and don't worry the fire doesn't actually work so none of this will set on fire. Then we also have mine and my sister's stocking that we have started to give each other every year hanging below! I love how the lights on the tree and the lights on the garland tie in with each other! We have decided to go a bit crazy this year and decorate in our hall way too because my mum bought so many garlands and she didn't know where to put them! There is one that says Let It Snow and then there's a snowflake garland each side which is so cute. In addition to this my mum also bought a plaque that has lots of things that you should do at Christmas time hanging in the spare space of wall. Then lastly we always stick the Christmas cards that we receive on the back of the hall door! Also instead of having a normal wreath like everyone else my family decided last year that it would be a good idea to stick a great big light up snowflake on the front door. I do like it don't get my wrong but its a bit large! 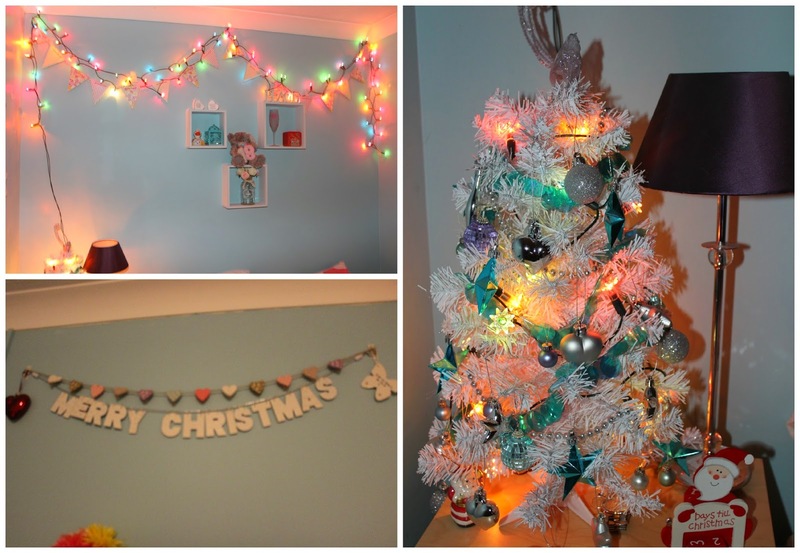 Lastly, in my room I have gone all out this year because I am massively into the Christmas spirit this year. I firstly bought a new door decoration from Blooms Garden Centre and it is just the cutest thing, I am loving fawn/reindeers at the moment and when I saw this I had to have it. Next up I just have my normal heard garland that is up all year round but I have added a 'Merry Christmas' one and some cute decorations at either end! As I said I am a little bit obsessed with fawn/reindeers at the moment so I have a little collection hanging on my wall. There are two traditional ones and then two slightly out there fawns, then alongside them I have my two gingerbread wall decorations too! Then I have my actual mini Christmas tree which I have had since I was about 13 that my nan bought be one year. It is a white tree and I have blue, green and silver decorations on there along with my multi-coloured lights which have also been going for years. Then next to that on my bedside table I just have my days until Christmas countdown which I always forget to change! Lastly, my favourite part of my room!! I recently bought some multi coloured lights and I didn't know where to put them and my best friend had the great idea to have them running along my bunting which was already up. I simply attached the wire to the same hooks that were holding the bunting up and then masking taped a few wires down to hold them in place. I don't think I'm going to take these down after Christmas because I love them too much and I really like them there! Those are all the Christmas decorations we have up at the moment but I think we are putting more up at the weekend outside. Let me know what your Christmas decorations are like, do you have a theme like my mum does? What is your favourite part about decorating your house? Let me know in the comments below! I am off to London tomorrow with my sister to have some festive fun before she has to work everyday until Christmas but I will see you all on Friday for another instalment of #CountdownToChristmas!